I like music. A lot. In fact, I love music. I have always felt such a connection with it that, at times, I don't even think its normal. If I am not listening to music, I am singing it - either out loud or in my head. Quite a while ago I came to the realization that if I were to think back to a time in my life when I was filled with such happiness, a great deal of that time was when I was part of a band. I associate those times with some of the most amazing feelings of fullness. The coming together of a group, taking a piece of music so raw and scratchy and turning it in to the most beautiful sounds. I have always been one to get chills when on stage and I'll admit I was moved to tears a time or two...while playing. Many people can appreciate this, many cannot. I've dabbled in different instruments over the years, but, just in case you don't already know, the clarinet is my favorite. 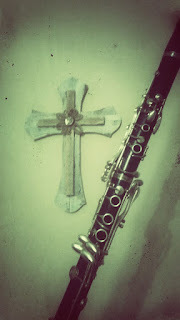 In fact, I love my clarinet so much he has a name -- Herschel. See what I mean about thinking my love of music is not normal? ha! Anyways... I have recently joined a community band and just the first practice has sent my heart soaring. It felt WONDERFUL to play Herschel with these folks. I have been on cloud 9 since. My confidence level is not where it used to be, though. After all, I am not as good as I once was and I think that line keeps bouncing around in my head. I love playing with other folks, but playing the solo artist? Not so much. So the other day I was being goofy and recorded myself playing a portion of a Mozart piece I have been practicing. This was a way for me to share my music without being put on the spot, so-to-speak. I played this recording for a couple of people. Afterwards, this happened: My partner pulls me aside to tell me that she almost feels like I am cheating people out of a gift of mine. That God gave me a talent and its almost not being fair that I keep it behind closed doors and not share. Yeah, that really got me. She is always so good at getting me to see things in a different light. I am self conscious of my ability, hard on myself and always looking for perfection. Yet, on the other hand, I can use this gift and praise God with it, right? Duh. Why didn't I think of that? I can make music and bring people together in fellowship. I can work with the worship team at church and lift up the melody to God. 2 Chronicles 5:13 (NKJV) says, " indeed it came to pass, when the trumpeters and singers were as one, to make one sound to be heard in praising and thanking the Lord, and when they lifted up their voice with the trumpets and cymbals and instruments of music, and praised the Lord, saying: For He is good, For His mercy endures forever." Music is sweet and God is good. Keep the praising goin 'til next time! Oh and, just for the fun of it, check this out... I cannot believe in my whole life I have never heard this. I am in love... Sigh... Adios!